How many cameras are deployed outdoors? We asked integrators in our Spring 2012 Survey to describe how commonly they deploy surveillance cameras outdoors and why. In this note, we examine deployment patterns of nearly 100 globally distributed integrators. Outdoor cameras are typically more costly than indoor cameras, due to expanded power and network infrastructure. Outdoor cameras are exposed to harsh elements, and require protective housings that include heaters, blowers, and Ingress Protection-rated enclosures. Outdoor cameras may require more costly features like WDR or illuminators to be effective in broad outdoor lighting conditions. Mounting a camera outdoors may also have the additional expense of special lifts, weatherproof enclosures for auxiliary equipment, security hardware, or special permits. 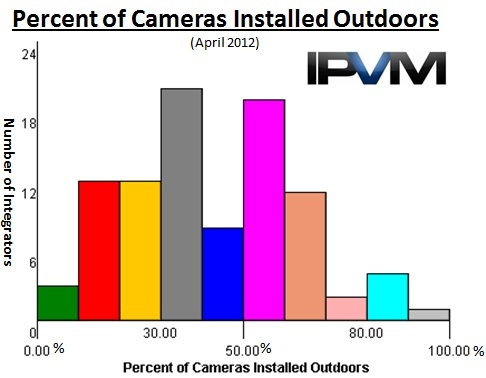 The results roughly follow a normal distribution, and mean results indicate that 40% of all cameras sold are hung outdoors. This may be viewed as surprising, given the additional costs when location cameras outdoors. In a follow up survey question, we asked integrators to clarify their initial responses. We display that feedback below. "Mostly specific applications such as water plants, airport perimeters and cameras located outside the building." "My major client is a rail network and we cover all train stations, which are in an external but sometimes under cover environment"
"Our specific applications tend to be outdoor surveillance for roads and town-centres"
"Our main business is public surveillance for law enforcement agencies. That's why most of our cameras are deployed outdoor"
"All of our installations are in the oil and gas sector (Kuwait), this is essentially perimeter security so 80% + of our cameras are outdoor's installed along fence lines." "We work a lot with parking spaces, public zones lile intersections and many government facilities need those specific spaces closely watched." "They are always for a specific need or sight line requirement. We mount a lot of rooftop camera to overlook parking lots and quite a few cameras above entry or exit doors." "The majority of our clients are under the assumption that real threats come from the outside"
"I perform Mostly residential installs. And most cameras are deployed outdoors"
"In our Utility work, most of the cameras are outdoors and use analytics. The other clients want to watch perimeter activity or parking areas." "Lastly, there's a concern about how employees, visitors, students, patients, tenants, etc feel about being watched." "usually, my clients prefer privacy inside, and prefer cover the outside. to come inside they need be outside first"
"Despite repeated articles and studies to the contrary, their fear is outsiders - not the people that are already inside the building that are already stealing from them." "there's a concern about how employees, visitors, students, patients, tenants, etc feel about being watched." "In Singapore, most of the commercial premise where the focus is protecting internal assets like r&d, shopping center and office building will require mostly indoor cameras." "We do lots of schools that seem to focus on the inside first and outside is mostly secondary." "Purpose of having cameras is to see who's doing what, where and when." "A lot of our larger installations come from the bid market and in our area it's equates to about 25% of the total cameras installed at a particular location. It varies from site to site as well, some installations are a majority (75%+) exterior cameras and a few we have none. Mostly it's driven by the customer what they want to view." "Most of our costumers want CCTV systems for their business, being a restaurant, a local shop, a factory, etcetera." Typical surveillance installations only use a small number of outdoor cameras. However, vertical markets primarily engaged in protecting assets or monitoring risk in outdoor areas, like critical infrastructure, municipal, transportation, law enforcement, and residential clients, place a premium on outdoor surveillance. To a lesser extent, outdoor cameras are installed for retail and other general businesses to monitor areas like parking lots, outdoor dining areas, and to anticipate external threats from entering indoor areas.